Ever wanted to visit the stunning Tirari Desert in South Australia? Win a spot on our popular 7 day Painted Desert Discovery tour departing in August 2019. 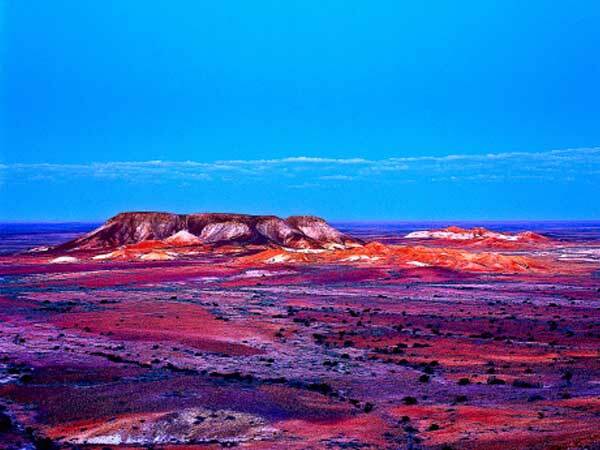 Imagine yourself travelling through the picturesque landscapes of the Flinders Ranges, past beautiful Lake Eyre and to the unique opal mining town of Coober Pedy. Explore the Tirari Desert’s mysterious group of hills and see sandstone in a mixture of stunning colours. Discover more of the Outback with a journey along the Stuart Highway to Cadney Homestead, Port Augusta & the Arid Lands Botanic Gardens before enjoying a farewell lunch at a cellar door in the famous Clare Valley wine region. Simply fill out our entry form and tell us why you’d like to win a spot on our amazing tour of South Australia’s Painted Desert! I agree to the terms & conditions of this promotion. These conditions apply to our “Win a Holiday to South Australia’s Unique Painted Desert” competition (the Promotion). The Promotion is being run by Holiday Wonders Travel & Cruise, ABN 84 418 237 843 (the Company). Entry is open to all readers of The Senior newspaper and visitors to the Holiday Wonders website (holidaywonders.com.au) or Senior Traveller Getaways website (seniortravellergetaways.com.au) from within Australia only. All employees, immediate family members of employees of any Company associated with the Promotion (including Senior Traveller Getaways & COTA Holidays) are ineligible to enter. The Promotion commences at 00:00 AEST on 21 March 2019 & ends at 23:59 AEST on 3 June 2019 (the Promotion Period). To enter, entrants must fill out an entry form during the Promotion Period and enter via the Win page on our websites (holidaywonders.com.au/win or seniortravellergetaways.com/win). Entrants will be asked to answer a question on the entry form, describing why they would like to visit the Painted Desert in 25 words or less. Answers will be judged at the time of the Draw and the most creative answer provided will be judged as the winner. The Prize draw will take place at the Holiday Wonders office, 212 Belair Road, Hawthorn SA 5062 at 12:00 AEST on 5 June 2019 (the Draw). The winner will receive 2 seats on our Painted Desert Discovery tour departing Adelaide on 7 August 2019 (the Prize). The Prize excluding flights to get to/from Adelaide. Total Prize value is AU$5,180. The Promotion is being held nationally across Australia, and there will be one winner overall. The Prize is not redeemable for cash, and is non-transferrable. The Prize winner will be notified by phone or email on the afternoon of 5 June 2019. The details of the Prize winner (name & state) will be published on our Website and on our marketing email on 7 June 2019. If the Prize is unclaimed or un-awarded, a Prize draw will be conducted on 5 July 2019 at the same time and place as the original draw. If a winner is drawn they will be contacted by phone or email and will have their details (name & state) published on our Website and on our marketing email on 7 July 2019. By entering into the draw, you agree to receive email marketing offers from the Company. You may choose to unsubscribe from this offer at any time by clicking on the unsubscribe button on any of the marketing emails. For more details on this Promotion, please contact us on the details shown at the bottom of this page.